is right: Advertising Will Change Forever. Digital Spending Will Nearly Double in 5 Years, But Ad Budgets Won’t. 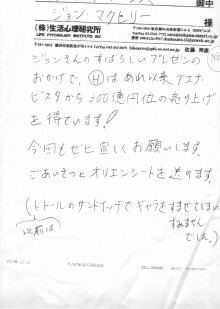 This image was scanned from a fax sent to John by Sato Kuniko, a now retired Hakuhodo account executive. ? @In it he says that John’s presentation skills were responsible for Hakuhodo winning what ultimately turned out to be 30 billion yen worth of media billings from Buena Vista International. Forgive me, I, too, was stunned. 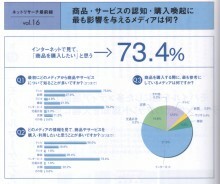 73.4% say information found on Internet stimulates desire for purchase. Only 56% say the same of TV. Due diligence requires us to note that the research results reported here are from an Internet research company, Ibridge, and reported in the February 2001 issue Senden Kaigi. Still the results are striking. Answers to Question No. 1 “From which medium do you first learn about new products or services?” show TV trailing the Internet by only 3.4% (75.8% vs. 79.2%). Other media fall way behind, with newspapers at 27.6%, radio at 4.8%, magazines at 21.0%, transit ads at 3.0% and in-store at 11.2%. It is in answers to Question No. 2 “Which medium most makes you want to purchase new products or services?” that the gap widens, with TV at only 56.0% vs. the Internet at 73.4%. Falling still further behind are newspapers at 18.8%, radio at 1.6%, and transit ads at 1.6%. Magazines do a bit better on this question, at 28.4%, as does in-store at 22.2%. The gaps widen still further in answers to Question No. 3 “To which medium do you turn for more information before making a purchase?” Here the Internet scores 57.6%, followed by in-store at 19.6%, TV at 12.6%, magazines at 6.6%, radio at 0.4% and transit ads at 0.2%. 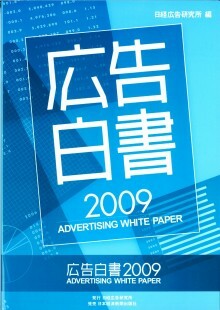 The first ever 29-station, whole JR Yamanote Line poster rally campaign with different posters at every station was the first of two media innovations noted in the October 2006 issue of Senden Kaigi. Ayase Haruka has starred in the dramas “Shouting About Love at the Center of the World”(???E????S??A??????????) and “White Night Travels”(???? ?s) and been featured in TV commercials for Ohtsuka Pharmaceuticals’ Poccari Sweat sports drink. To celebrate the release of her new CD “Intersection Days” (???? ?_days), 29 posters were created, one for each of the 29 stations on Tokyo’s JR Yamanote Line. 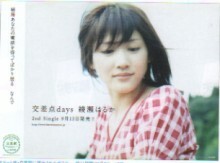 Each poster featured a different image of Ayase and a line from the lyrics of the songs on the CD. According to a Victor Entertainment spokesman the use of the lyrics in 29 different posters was designed to stimulate imagination and attract fans. If you want to sell cars, what better place to advertise them than in a parking garage. 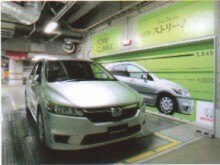 That seems to have been the idea behind the creation of a 3D ad combining an actual car with images and copy painted on the wall beside it in Roppongi Hills, Shibuya Parco, La Chic (Nagoya) and other parking garages in fashionable shopping areas.